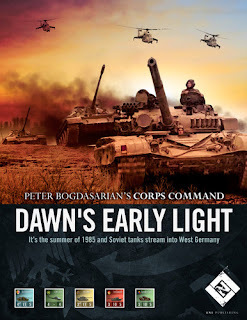 Today's game is Lock 'n Load's Corps Command: Dawn's Early Light, a fun brigade/regimental level game that features the Warsaw Pact invading West Germany in 1985! In this scenario, the Soviets push some divisions down south to crush the Canadian 4th Mechanized brigade and the US 5th Armored Division and take the surrounding cities. The 4 CMBG consists of two infantry battalions and a tank battalion of Leopard C1s. The Canucks are pretty decent fighters with the best infantry in the game. The Leopard C1s aren't quite as great as the German Leopard IIs or the US M1 tanks but they can hold their own pretty well. 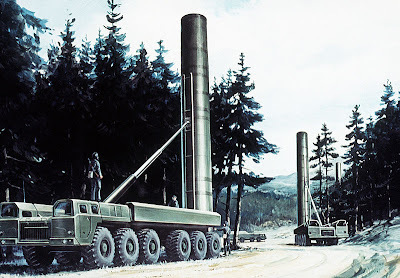 I deploy them in the western area of the map, hoping to set up some clever ambushes in the rough forested area and trap the Soviets in there for as long as possible. Good luck, Canadians! The objective is for the West Germans to take the city of Eben. The 1/71st deploys down south on the hills just to the west of Eben while the Leopards from the 2/174 deploy in the town of Obetz far to the north. The 33rd Motorized Rifle Division deploys its resources carefully in Eben, forming a ring of infantry and armored carriers on the outskirts and the command and anti-air forces safely in the downtown area. Meanwhile, north of Eben sits the 87th Rifle Division, ready to either reinforce Eben or try for an attack on the West German forces as they make their approach to Eben. Turn 1: The West German Marders of the 1/171st drop off their infantry on the hillside to the southwest of Eben. The Soviet 33rd MRD commander counters by sending out his own infantry towards the hill.The Leopards Is from the 2/174 move into the forest east of Obetz and start hammering on the armored carriers in Eben from long range. I've been getting back into Corps Command: Dawn's Early Light recently and here are some things I've started to understand about different Soviet and NATO strategies. I'm writing this article as advice for beginners to the series. I'm definitely not a tactical genius (as my opponents will surely attest) but I think this is a good basic guide for those who are interested in this under-rated gem of a game. Soviets: I used to lose as the Soviets all the time. The reason was that I would basically just run up to NATO units and hammer away on them until I destroyed enough units to make an advance. If you're very lucky, this strategy might work but the inherent NATO firepower advantage means that you're playing into their hands by adopting this strategy. You might take out a few NATO units but your Soviets will be so utterly decimated by that time, you won't have enough strength to take your objective. Today, I'm going to post a short playthrough of Dawn's Early Light, which is part of LnL's Corps Command system. This is a more operational level wargame that takes place in the World at War universe in which the Soviets invade West Germany in 1985. In contrast to the playthrough from the other day where I tried to document every single thing that happened, I'm going to only give a general description of what happened in each day of this game. The first scenario, "Dawn's Early Light", takes place on the opening day of WW3. The Soviet player gets victory points for either capturing Stahlhammer AFB, having a line of communication to Eisenbach and moving forces off the west side of the map. The NATO player wins by preventing two of these things from happening. The 2/182 activates and starts firing Milan missiles at the Soviet BMP-2 sitting in the treeline in hex I5. They score a reduction and a disruption. The German infantry fire mortars at the Soviet infantry but don't score any hits. The 2/174 Panzer activates next. Deciding to sneak around the city and assault from the south, the big Leopards advance north. The 2nd Airborne activates and the BMP-2 in hex I5 is undisrupted. The Soviet HQ sends an infantry platoon to hex M2 to beef up the southern defense. The 2/174 activates again and keeps moving north towards Tanenhause. An End Turn marker is pulled. The 2/182 activates again and the infantry with Milan hits at the BMP-2. The second end marker is pulled. The turn is over. Not much happened except for the 2/174 advancing steadily north towards Tanenhause. The 1/613 didn't activate at all. A disappointing turn for the Germans. Today, I'm doing an AAR of another great scenario from LnL's World at War Compendium which was originally featured somewhere in the first seven issues of Lock 'n Load Publishing's in-house gaming magazine, "Line of Fire". "The Relief of Tanenhause" has everything a World at War player could want. It features a tough battle between the Soviet 2nd Airborne as they try desperately to defend the city of Tanenhause from an impressive German assault that includes three companies of tanks, infantry and armored personnel carriers. The twisted wreckage of Syrian tanks surround Team Azzam as it makes a final bid to escape a Syrian trap and capture the town just a few miles to the north. Can they make it? The Israelis manage to blast away the last of the assaulting tanks thanks to lucky die rolls and double-activating for multiple turns. The Syrians have managed to assemble their remaining tanks for a push at the lone Soltam sitting in the city objective. Two Syrian T-72s provide overwatch from afar. Time is quickly running out for the Israelis. ...and makes it to B4 before it dies under a hail of Opportunity Fire from the Syrian T-72s in hex H6. Today, I'll be giving a very brief report of a scenario called "The Road to Armageddon" set in the World at War universe. This scenario brings in the Israelis and Syrians for a nicely set up slugfest. The Syrians get 10 T-72s and a Shilka. The Israelis get 3 platoons of slow but tough Merkava tanks and an F-4E Phantom for air support. The Syrians are the defenders and the Israelis' job is to take the city hexes in the northwest corner of the map, which are outlined in white. The Syrians set up on the hilltops in the center of the map. This covers the approaches quite thoroughly. If the Israelis make a dash for the town, the Syrian T-72s will close assault them and destroy them easily. The Israeli commander, not having been born yesterday, sneaks his units on the map from the southeast and travels along the large hillside, which provides complete cover from the Syrian T-72s. Central America, a wargame based on modern conflict in Nicaragua and surrounding countries, is very much a product of its time. 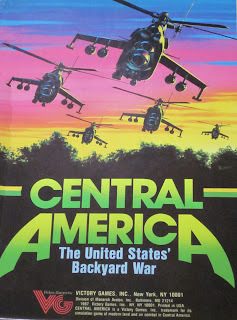 Designed by James H. McQuaid and developed by Mark Herman (Gulf Strike, Pacific War, and many others), Central America was published in 1987. I received a beautiful used copy of Victory Games' "Central America" in the mail the other day and I've been grappling with it since then. It's an extremely complex game with lots of little rules that don't immediately click until you've done a lot of reading and re-reading of the rule book. I've been playing the Introductory Scenarios recently and I finally felt confident enough about my rules knowledge to post an AAR for it. I'll be writing up a review later so hopefully that will answer any questions for those who aren't familiar with this lovely gem published back in 1987. I've recorded the play in Vassal so as to make screenshots a little easier to understand since there is so much stacking of units in the game.